Neil and I were first brought together by DC editor Karen Berger, when she offered me two projects to letter: a three issue painted mini-series, BLACK ORCHID, and the first issue of an ongoing monthly comic, SANDMAN. I was offered both at the same time, probably late fall of 1987, had room on my schedule, and accepted the assignments, though I hadn't heard of Neil at the time. As I recall, some of Dave McKean's painted art was already in Karen's hands for BLACK ORCHID, so I started on that first. One request I remember from Dave and Neil, conveyed by Karen, was that I letter small on this job. They had tried another letterer, and thought his samples too large. As Dave's art was oversized, considerably bigger than the comics pages I was used to working on, this was no problem, I simply lettered at my usual size and the result looked small. Since these were painted pages, the lettering was done on vellum overlays, and the caption/balloon coloring was put in later, not by me. Though Neil now doesn't seem to care much for his writing on Black Orchid, I enjoyed it, and Dave's art was terrific, so I had quite a good time working on the project. After the book was printed, other artists I was working with complained, "How come you don't letter that small on my book?" Artists always seem to want the lettering as small as possible to allow more of their art to show. My answer was, "If you draw (or paint) larger, I can letter smaller." These days, lettering on the computer allows me to letter as small as necessary, though the lettering still has to be easily readable. The lettering on BLACK ORCHID, as printed, is about as small as I'd want to work, and needs good quality paper to read well. 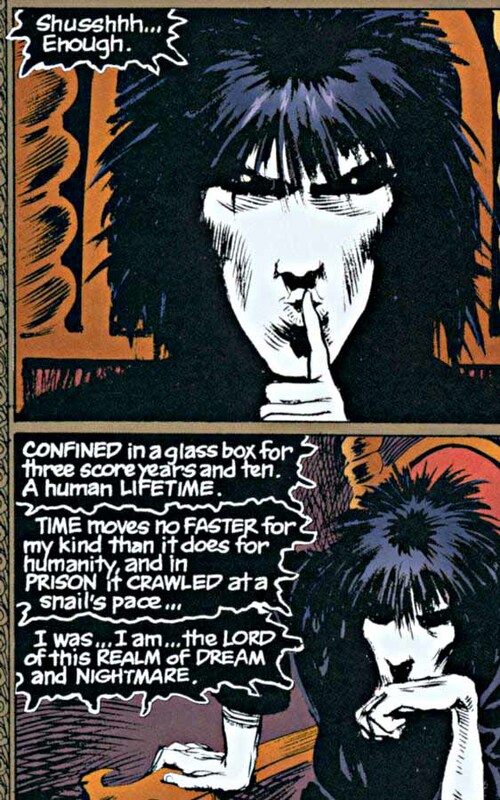 Soon after starting on BLACK ORCHID I began lettering the first issue of SANDMAN. I have to say I wasn't terribly impressed with Sam Kieth's pencils (sorry, Sam), but I loved Neil's script from the start. Looking back at it now, and trying to perceive why, here are some things that come to mind. First, even in this first issue, there was a feeling of a carefully worked-out history and background. Indeed, it begins in the past, and carries through most of the 20th century. Except for some of Alan Moore's impressive projects, this was not a story element I had encountered often in comics; and the history and background involved magic, mysteriously powerful archetypal beings, horror, ordinary people, and actual history, a good combination. Second, for an origin story, the main character has a very unusual presence in most of this first issue: he's a helpless prisoner who says very little and conveys less. The unexpected is always refreshing, and this certainly was, at the same time creating a sympathetic character, even though we knew almost nothing about him, except that he was the "Kinge of Dremes". When he finally escapes and we find out a little of what this means, it opens up vast expanses of storytelling landscape virtually untouched by anyone else in comics history, other than Winsor McCay in "Little Nemo in Slumberland", and those were all pretty superficial story-wise. Everyone has dreams...a character who has power over them, in fact lives among them; well, it's hard to imagine any limit to the kinds of things he could do, or the variety of stories Neil could tell about him. Oh, and his sister is Death. Very interesting, what else is waiting around the next corner? I could hardly wait to find out. While Neil's request from me for a wide variety of lettering styles was just getting started, the main character clearly needed a unique style. I've told the story many times, but Dream's white-on-black lettering was not actually lettered that way by me, but was lettered normally (black on white), then a reverse or negative photostat was made of the lettering in DC's production department and pasted over my lettering for each of Sandman's balloons. This was Karen Berger's idea. I was against it. You see, I'd worked in DC's production department for 10 years previous to this, and I knew that the reverse stats would vary greatly in quality, sometimes being too dark and hard to read, sometimes being too light, with the letters running together, also hard to read. And it was often the case. It did certainly make the character's "voice" distinctive, though, and in the long run worked well. I can only say I'm glad I was overruled. And now, in THE ABSOLUTE SANDMAN, the worst of the bad reverse stats have been corrected, and it's largely looking better than I ever hoped it could.